Note: This article contains an exclusive phone interview with Brian Terry's brother, Kent Terry. A full transcript of this interview follows this article. Comments are welcomed at the bottom of this page. Two years ago, a US Border Patrol BORTAC Team was responding to a sensor alert in the Peckwell/Rio Ricco sector of Southern Arizona. This region was known to have violent Mexican gangs known as RIP Crews. These RIP Crews would roam these mountains preying on other drug smugglers and human trafficking coyotes. Agent Brian Terry was a member of this elite BORTAC Team. Upon encountering the RIP Crew a gun battle ensued leaving Brian Terry dying in the desert sand and one of the bandit's wounded. Now, after two years of Congressional hearings and Department of Justice (DOJ) investigations, we know little more now than we did shortly after that night. What we do know is this. Brian Terry was murdered by a Mexican gang. Two guns which were delivered to this gang through a program named Operation Fast and Furious were found at the scene. One person from the gang that killed Terry has been convicted of Terry's murder and is awaiting sentencing. Several gun dealers involved in Fast and Furious have been convicted including the man who purchased the two guns found at the murder scene. He received a sentence of 57 months for illegal gun purchases. Not one person in the federal government who authorized this illegal gun running program has been charged or convicted for their role in Brian Terry's murder. During this period I have had the honor of getting to know some of Brian Terry's family who are seeking the truth for Brian. Brian's older brother, Kent Terry, spoke with me in a phone interview and discussed Brian, Fast and Furious and his family's pursuit of justice. Following is a photo slide show and the audio of my phone conversation with Kent Terry. A full transcript of the interview can be found immediately following this story. One of the first things I noticed while looking into Brian's death was a very strong feeling the FBI was withholding information. The kind of information that was very forthcoming in other investigations like the shooting of US Representative Gabrielle Giffords a few weeks after Terry's murder. I asked Kent if he got that impression early on as well. Kent replied, "Oh absolutely, absolutely. We found out later on that the FBI showed up right away and then we heard that Brian laid out there for five hours, then we heard they took him right away. We don't know what to believe. To this day, we still don't know what to believe. We heard he was carried out of there as soon as it happened and we hear other stories that he laid there for five hours while they helicoptered the other guy out. So the stories we're hearing from different people are not adding up. The people that were out there that night, the FBI, everything." One of the early questions that remains unanswered is the Border Patrol policy of using "less than lethal" weapons when encountering these violent groups. Kent explained, "What I heard, like I said different stories, I heard two of the BORTAC agents had non-lethal and two of them had lethal, and Brian supposedly had a lethal weapon on him, but he never fired a round. So I've heard they all fired and then I heard Brian never fired, but as far as they all had non-lethal, I'm not sure. Last I heard, two of them did and two of them didn't." This is factual information the government should be able to answer, but they have not. Why? Two of the weapons used by the gang members found at the scene were later identified as being part of the Fast and Furious program. This was initially denied by Assistant Attorney General Ronald Weich. However, Sen. Charles Grassley proved very quickly he was lying. I asked Kent about whether these guns were actually the weapons that killed Brian. He replied, "They never confirmed but that it was inconclusive. It is a 7.62 round, which is an AK-47 that killed Brian. They didn't say they were those exact guns, but my belief is these guys know they just got in a gun fight with the BORTAC agents, or border control, and majority dropped the guns at the scene. I can't see the murder weapon being dragged 17 miles back in Mexico knowing they just got in a gun fight and risk getting apprehended by other border patrol agents with that weapon. I don't know, like I said, I'm not a believer, I think one of those weapons there was the actual gun that killed Brian. Like I said, we get different answers." After the interview with Kent, we continued our conversation. Kent told me he was twelve months and 18 days older than Brian. In a twist of fate, Brian would return home from Arizona for the final time on 12/18. Kent Terry, his sisters, his mother and his entire family continue to seek justice for Brian. Our government's executive branch continues to stand in the way of this. Kent told me he wants to issue the following challenge to US Attorney General Eric Holder. "Come meet with me, face to face and answer my questions. This is the only way you can prove your innocence." Somehow, after being held in Contempt of Congress for refusing to turn over documents required for Congressional oversight, I doubt Eric Holder is man enough to face Brian Terry's family and answer direct questions. Brian Terry's legacy lives on. His family has formed a foundation in Brian's memory to provide support to the families of fallen US Border Patrol Agents. It also provides for scholarships for the children of fallen agents. Please visit the Brian Terry Foundation at www.HonorBrianTerry.com. While visiting Naco, Arizona earlier this month I had the opportunity to visit the newly renamed Brian Terry Border Patrol Station near Bisbee. I spoke with agents at the station and along the border fence. While, because of fear of retaliation from superiors, they could not say very much, those I met who knew Brian expressed the utmost respect for him as a man and a Border Patrol agent. Brian served his country nearly all of his adult life. He was a military veteran in addition to his Border Patrol service. He was loved and respected by all who served with him. I would personally like to thank Senators Charles Grassley (R-NE) and John Cornyn (R-TX) along with US Representatives Darrell Issa (R-CA), Mike Turner (R-OH), Ted Poe (R-TX), Sam Gowdy (R-SC) for their investigations into this matter. I have spoken with all of these public servants and/or their staff members who take their responsibility of Congressional Oversight very seriously. Please take a moment on this second anniversary of Brian's death to listen to my interview with Kent. Feel, not only his pain from his loss, but his commitment to finding the truth. Commit yourself to staying involved in this investigation as we all move forward to find justice for Brian Terry. Those involved in this process must not be allowed to simply be reassigned or to retire. They must be prosecuted and held accountable for the irresponsible actions that led to the death of Brian Terry, Jaime Zapata and hundreds of Mexican citizens who have been killed by guns put into the wrong hands by our government. Bob Price: December 14th marks the second anniversary of the death of US Border Patrol agent Brian Terry. 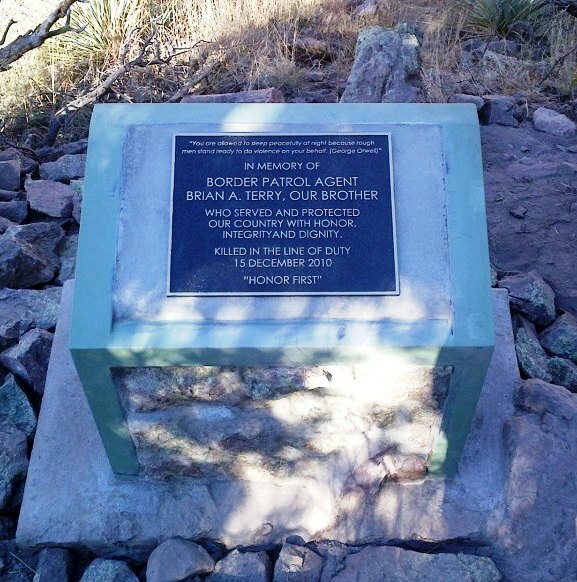 On the night of the 14th Brian Terry was out on patrol with his BORTAC team in the Southern Arizona mountains. During this patrol they encountered one of the Mexican bandit rip crews that prey on drug dealers and illegal aliens in this region. A gun battle ensued leading to Brian Terry’s death. I first wrote about this story the day after it happened. Almost immediately, after talking with the FBI and the Border Patrol. I started getting a sense of something horribly wrong. As we all later learned, this was the beginning of the unraveling of what started as an Obama Administration political ploy for more gun control laws and has now become the scandal known as Operation Fast and Furious. Today on the phone I have the honor of talking with Brian's older brother, Kent Terry. Kent, welcome to TexasGOPVote. Kent Terry: How are you doing? Bob Price: Doing great, thank you for coming on with us today to talk about this. I know this is a sad anniversary that you wished you didn't have to face and wished you had some better answers at this point. How have you been doing with this since this happened? Kent Terry: You know what, I'm numb to the fact. I still feel like it just happened yesterday. The answers and the treatment we've gotten, actually we haven't gotten any answers. I feel numb. I feel like it just happened yesterday. Bob Price: Yeah, it really is amazing how fast the time has gone on this. We wrote about it several times, and there were a lot of other bloggers out there that did a lot of research that kept this story alive until the mainstream media finally picked it up. Sharyl Attkisson from CBS I think was the first national media to pick it up, but the story was just being ignored for so long. What were you hearing in the early days of this incident? Kent Terry: Well, a lot of lies. A lot of lies with the attorney Dennis Burke out of Arizona. He lied about 90% of the story they gave us about what happened about the guns, everything. And the feedback we're getting back from the FBI, the stories about what they were doing that night and what happened, different stories from different agents, it's just that nothing was making sense. Bob Price: Yeah that was the same feedback I was getting when I was talking to various people. You could just tell right away they were in cover-up mode and trying to hide something. Kent Terry: Oh absolutely, absolutely. We found out later on that the FBI showed up right away and then we heard that Brian laid out there for five hours, then we heard they took him right away. We don't know what to believe. To this day, we still don't know what to believe. We heard he was carried out of there as soon as it happened and we hear other stories that he laid there for five hours while they helicoptered the other guy out. So the stories we're hearing from different people are not adding up. The people that were out there that night, the FBI, everything. Bob Price: Now when you say helicoptered the other guy out, you're talking about Manuel Osorio-Arellanes, who's the only person that's been convicted I guess in Brian's shooting at this point. Bob Price: He plead guilty and will be sentenced to life in prison I guess in March. Yeah, they helicoptered him out right away, and we never have gotten the real story on the timing of what happened with Brian. Kent Terry: No, we still haven't gotten the timing. You know, the ballistics, everything seems to take its time. When the Ivie incident happened, the ballistics report come back right away. Brian's took I think 13 days. How can they do one faster than the other? Like I said, we heard multiple, multiple different stories. Bob Price: One of the stories we heard early on was that the border patrol agents were under instructions to use less-than-lethal weapons when they first encountered these rip crews. Has that been proven to be accurate? Kent Terry: What I heard, like I said different stories, I heard two of the BORTAC agents had non-lethal and two of them had lethal, and Brian supposedly had a lethal weapon on him, but he never fired a round. So I've heard they all fired and then I heard Brian never fired, but as far as they all had non-lethal, I'm not sure. Last I heard, two of them did and two of them didn't. Bob Price: Now two of the weapons that had been sold into the what's now become as the Fast and Furious scandal were found at the scene of the incident and initially the justice Department denied these were part of Operation Fast and Furious until Senator Grassley's office produced the documents that they've gotten from some whistleblowers. Has there been any documentation as to whether those were actually the murder weapons, or was it a different weapon that shot Brian? Kent Terry: Again, that's all they told us. They never confirmed but that it was inconclusive. It is a 7.62 round, which is an AK-47 that killed Brian. They didn't say they were those exact guns, but my belief is these guys know they just got in a gun fight with the BORTAC agents, or border control, and majority dropped the guns at the scene. I can't see the murder weapon being dragged 17 miles back in Mexico knowing they just got in a gun fight and risk getting apprehended by other border patrol agents with that weapon. I don't know, like I said, I'm not a believer, I think one of those weapons there was the actual gun that killed Brian. Like I said, we get different answers. Some people say yes, some people say there's a third gun they found that night, and I remember me and my sister that night Brian got killed, we had a phone call that said they apprehended one guy, four guys, and they did find the third gun. Well then all of a sudden the story changed a week later. There were only two guns at the scene and they still apprehended the one guy that was shot twice, I think once in the stomach and once in the leg. Bob Price: Yeah, they've actually apprehended some other people that night who were later released and deported back into Mexico very quickly. Kent Terry: Yeah that's the thing too, they said they apprehended four people, but they were released the very next day, and all of a sudden they confirm later on that there were four individuals out there that to me it's kind of ironic that they caught four that night but four go the next day and all of a sudden there were four that were at the scene, so five all together with the one that got shot. You know I've heard different stories. One was an informant, that's why they let him go. You know, I've heard multiple stories, and it's not from ordinary people that told it to me, it was Border Patrol, they were all kinds of people that were in the law enforcement field that told us this stuff. Bob Price: Kent, how did you and your sister find out about the incident? Kent Terry: I was at home getting ready to go to work, my sister Kelly was getting ready to go to work, my mom was at work, and they'd come to my mother's house first. She wasn't here, so they went to Kelly's house, and she got the knock at the door, and she knew right away, as soon as she'd seen the Border Patrol vehicle, she knew right away, and then she contacted me, but she didn't tell me on the phone. She just told me I needed to get over there right away and the Border Patrol had already gone by that time, and she told me, and I just fainted, I passed out. Bob Price: I just can't imagine the shock of that. Kent Terry: Well because I'd just talked to him two days before that, and I was supposed to pick him up two days after he got killed. I was supposed to pick him up at the airport. So I was just like no way, he was supposed to come home Friday, you know, there's no way this can happen because I just talked to him Sunday, he was supposed to be coming home. Bob Price: Coming home for Christmas. Kent Terry: Yeah, first Christmas in four years. Bob Price: Wow. Kent, what's this been like in dealing with government. I know the legislative branch with Congressman Issa's committee and Senator Grassley have both been real supportive. What have you heard from them, and what's going on with the Executive Branch? Kent Terry: I haven't heard anything really since they found Holder in contempt back this past Summer, was it June or July? Actually, I really haven't heard anything since then. They said they were going to file charges against him. I haven't heard anything, but from Issa and Gowdy and Grassley, tremendous job, those guys are top notch. That's how the country should be run with those kind of guys. I was very, very disappointed how the Democratic Party, Pelosi, Cummings, what Cummings even said to my mom was that he's going to get justice, he doesn't care what stone gets unturned, they're going to hold them responsible and he and Pelosi walked out. You remember that? I remember that. That was a slap to every military, every law enforcement, saying right there, your government is not going to protect you. Bob Price: You know, there's been a long history of the government turning its back on the Border Patrol with the incidences that happened in Texas with Johnny Sutton prosecuting several Border Patrol agents for just basically routine police procedures. It makes you wonder how much hesitation agents have when they encounter a situation like your brother encountered before they can decide whether to defend themselves or not. Kent Terry:Yeah, they've got more rights than our own people here. I'm for everyone coming here and bettering it up, I really am, but just do it the right way. I mean all of our families here originated from other countries, we're all immigrants, but you know, we all did it the right way. Coming over the Ellis Island, staying two weeks, whatever they had to do, get a job here, everything. Now they just come here, our Border Patrol, our law enforcement, they get punished more than what these illegals do for their actions. Like the Border Patrol Agent Diaz apprehended the guy the wrong way and look what happened. Bob Price: For our readers that might not be too familiar with that, basically Agent Diaz was lifting a captured prisoner up off the ground, and the prisoner started to resist, then he used a standard police tactic of grabbing the handcuffs and lifting his arms up a little bit backwards to create pressure to get control of the person. There were no injuries, no bruising and he's still in prison for that. So it's a rough job those young men and women have down there. I was on the border near Naco about a week or so ago and talked to several of the agents, and they had very kind things to say about your brother, and it was very clear that he was a top-notch agent and well-liked by his peers. Kent Terry: He served twenty years of his life out of forty, he served this country. And you got to figure from the time he was born until he was a teenager, he went from being a teenager to school to the military to law enforcement. That was his life. Reading the John Shipley story, the FBI agent, how this government is treating these law enforcement and hiding the corruption up you know in the Administration. John Shipley sold a gun and that person sold it to someone else and that person sold it. Well it ended up in Mexico. Well he's serving prison time, Shipley did, he's an FBI agent, fourteen years. Then you have these people like Newell, Voth, McAllister, can't remember the guy's name, that sold these weapons and let these weapons walk and it killed two federal agents, Zapata and my brother and how many Mexicans, 300 I think was the last count, and nothing has happened to these guys, nothing until recently. These guys get a paycheck, they get a nice pension, knowing that there are still 4,500-5,000 AK-47s out there across this country all the way to New York, Chicago, Detroit, everywhere, that may be involved in other law enforcement members' deaths, and nothing has happened. These guys need to be prosecuted. Issa needs to start a team that can investigate these guys and have the ability prosecute these guys. That's what we need. Bob Price: Clearly, we had an opportunity to make a change, and unfortunately the country didn't go with us on that, but we do need to find a way to bring justice for Brian. Last week, Jaime Avila was convicted for actually making the straw purchase of these guns that were found at the scene and received 57 months in prison, barely a slap on the wrist in my opinion, but I understand that he made an apology to your family in your courtroom. How do you react to that? Kent Terry: His sister said it well. He got caught up in a corruption scheme. He got hooked on the wrong crowd and they dragged him in. I forgive the guy. but he didn't care at the time. He was feeding his habit and doing whatever he was doing. Like you said, 57 months, it should be longer than that. These guns are going to show up in more deaths. Who's going to be responsible six years from now when a law enforcement agent gets killed or a border agent gets killed. Who's going to be responsible for that weapon? Bob Price: Well certainly not Eric Holder it doesn't seem. Kent Terry: No, not Eric Holder at all. He's invincible for some reason. Bob Price: Well Kent, where do you guys go from here in terms of the pursuit of justice? Kent Terry: You know, as long as I live, as long as I'm around, I'm going to be knocking on doors to find out what happened, not just for my brother, like I said, it's going to be a lot of people, a lot of injured people, a lot of weapons out there. As long as I live, I'll do the every tone unturned part. I will find answers, I will. We've got a lot of help with Issa and his team, and I think justice will be served. I think it'll come down to they'll find out that Holder had something to do with it. Bob Price: Well, we're certainly not going to let up on it, and I know the other bloggers that have been following this story are challenging the government on it, on every aspect of it as we all are trying to do because there are clearly more lies that are being covered up here. When you look at what happened to Brian, and you looked at what happened with Ambassador Stevens in Libya with the Benghazi incident, there's a lot of similarities there. Kent Terry: There's a lot, and it all leads to…I'm going to ask you a question. How can Holder's two main men, Grindler and Weinstein, know about this and apparently never told Holder about this. Not even a conversation over coffee, over dinner, over lunch, whatever he did, and it never got brought up? Come on now. Bob Price: Yeah, I'm certainly not buying that, and I know you're not either, and you know, when the Obama Administration first came into office, they set out a political agenda to prove that there were guns going into Mexico so that they could enable more gun control in this country. They used that political agenda and created this Fast and Furious operation, and it has led to murder. The murder of Brian and the murder of the agent down in Mexico, Agent Zapata, and the murder of hundreds of Mexican citizens along the borders with these thousands of guns that they've let go back into Mexico. Kent Terry: We know when they were questioning Eric Holder, and Horowitz, the inspector, the guy that did the investigation on Holder, he said that Holder has no prior knowledge to Operation Gunrunner, Wide Receiver, or Fast and Furious prior to 2011. Well I found videos from Fox News, media, with Carney and even Holder talking about starting a program and he even talked about Gunrunner and guns walking and stuff like that back in 2009. There's all kinds of cover-ups here. And the inspector's report goes right from Wide Receiver to Gunrunner to the conclusion of Fast and Furious, nothing in between. Bob Price: Yeah, I think it's pretty clear that this goes all the way to the top and probably even into the White House. I certainly hope the House of Representatives will move forward with impeachment charges against the Attorney General, and if they can find a trail to the White House, take it all the way there. Kent Terry: Absolutely, I hope so too. I hope so for my brother, Zapata, and the Mexicans that got killed with these weapons. Bob Price: One last thing, tell me a little bit about the Brian Terry Foundation and your cousin, is it Bob Heyer? Kent Terry: Yes, Bobby Heyer. Bob Price: Tell us about that foundation, and what it's doing. Kent Terry: Bobby is doing an excellent job by the way getting it started for us. The foundation is to help fallen border patrol agents' families in situations like what happened with my brother and Ivie and Zapata. It will help them with funeral expenses, travel expenses. It'll help their kids if they have kids that are in the middle of going to school, it'll help them with their finances and just be supportive. Bob Price: And people can help the foundation by going to honorbrianterry.com, and there's a lot of information there about what's been going on since Brian's death and what the foundation is all about. Bob Price: Kent, I want to thank you for taking the time to come and talk about this on this very tragic anniversary, and I know it's not an easy thing to talk about. My prayers are certainly with you and your family as you go into this holiday season still with no answers from our government. Kent Terry: Thank you sir. Bob Price: If there's anything that we can do for you in the future, I hope you will let us know. Bob Price: Well thank you very much again, and I look forward to finding a resolution of this with you at some point in time in the not too distant future. Kent Terry: Well, thanks Bob for keeping the story alive here. I appreciate it.